The actual wiring of computer memory is called an address bus. 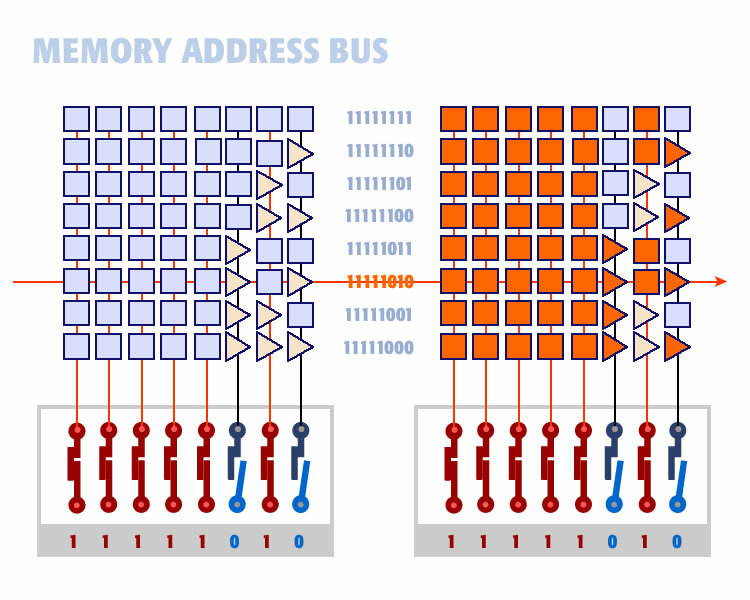 An address bus is the wiring that gives each specific memory location its own unique address. The address bus allows the computer to access one specific mailbox from among millions of available mailboxes. 1. The first element is the Gate shown left. When power is applied to the input the electromagnet switch is closes and current is allowed to pass. Conversely, when current is no current is applied the electromagnet opens and current cannot pass. We shown this gate is a square. 2. The second element is the NOT Gate. When power is applied to the input the electromagnet the switch is opened and current is stopped. Conversely, when no current is applied to the electromagnet the switch closes and current is allowed to pass. We show the NOT Gate as a triangle. The address bus is made up from just these two elements. The square opens with current. The triangle closes with current and vice versa. Creating an address bus is a matter of arranging these two building blocks into a matrix of binary numbers. This illustration shows a section of an eight line address bus. The squares and triangles are arranged like numbers in a sequence. A square represents a one and a triangle represents zero. Each row of gates represents a unique binary number manifested in hard aware. 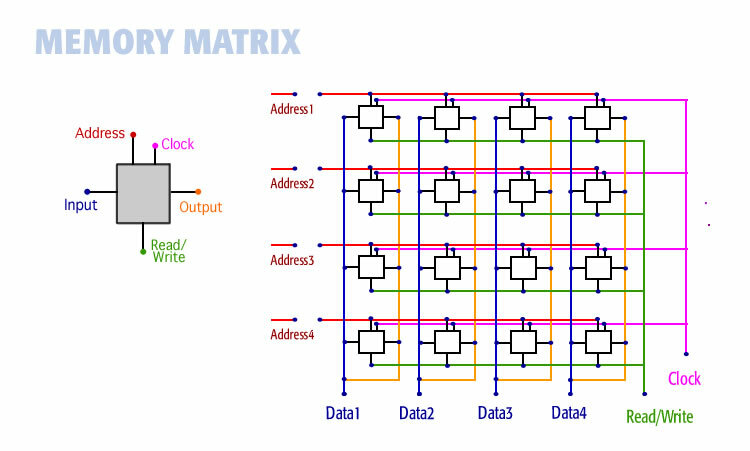 We are going to enter a binary number in the address register as shown on the lower left of the diagram above. The number we enter is 11111010. We enter it by opening or closing switches. In this case we close the first five switches, open the sixth, close the seventh, and open the eight. The result is turning ON lines 1 to 5, and 7 and turning OFF lines 6 and 8. 1. All squares turn ON when current is applied. 2. All triangles turn ON when no current is applied. Gates turned ON are shown in orange. As you can see only one memory address matches the binary number entered on the bus. That is memory location 11111010. It is the only combination of squares and triangles that are lit allowing current to get all the way from left to right. The memory bus applies current to that one memory address only. The arrangement of gates is how computers store and access data to and from unique memory addresses. The illustration on the left shows the address line ON, read/write line ON, and data line ON. These AND together. The input state (ON or OFF) gets through to the second AND gate where it is ANDED with the clock line. When the clock line is ON the data sets into the bit. The address line, state of the bit, read/write line, and clock line are all ON. They AND together. This places the state of the bit (either ON or OFF) on the output line. 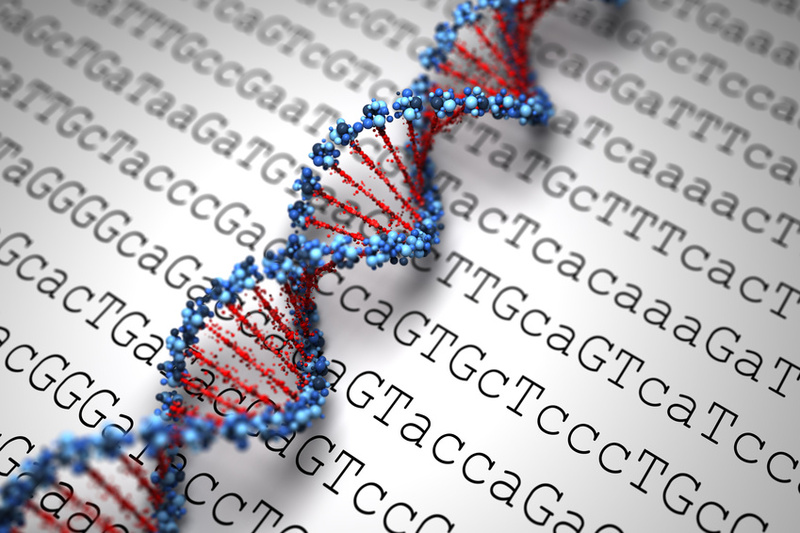 Memory is the same bit repeated thousands of times arranged into a matrix. The illustration below shows 16 bits arranged into a four by four memory matrix. Each bit is identical. 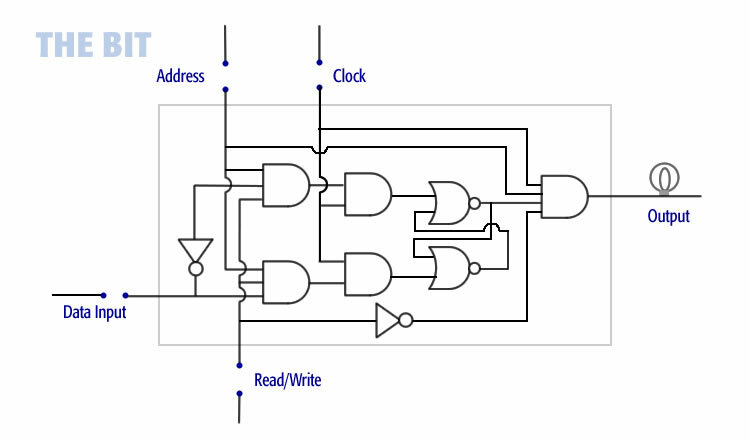 The illustration shows how bits are connected via the address, data, read/write, clock, and output lines. Reading data is a matter of turning ON or OFF the various lines. For example the read/write line tells the computer whether you are reading data from a bit or writing data to it. This 16-bit memory shown above is accurate. Memory in a computer is like this but there are more bits, address lines, and data lines but the logic is identical.